This year's Gold Cup at the Royal meeting will be renamed to mark the Queen's 90th birthday, Ascot racecourse has announced. The two-and-a-half mile race, won by Her Majesty's Estimate in 2013, will now be called the Gold Cup in Honour of The Queen's 90th birthday. 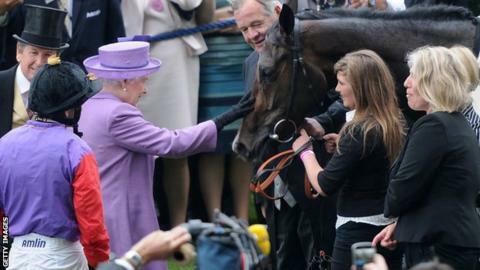 Her Majesty's representative at Ascot, Johnny Weatherby, said the Queen is "delighted" by the decision. The race, which will be run on 16 June, will revert to the Gold Cup in 2017. Mr Weatherby added: "The Gold Cup, recently won of course by the Queen herself, is the historic centrepiece of Royal Ascot, and is very much the race which resonates most with the public." The Queen's birthday is on 21 April.